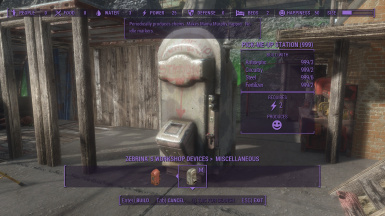 Adds many unconventional and scripted objects and devices to the settlement workshop. Fallout 4 Script Extender Not sure which version is required but you should use the latest version possible. You may modify and use anything separate or as part of another mod. Just please let me know, and maybe give credit if you feel like. 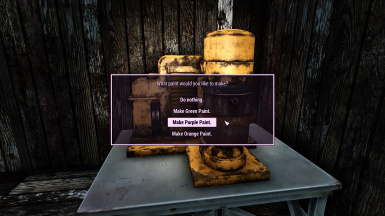 The Fallout 4 modding community. - Added a working modular quarry elevator. Functions similar to the lifts in that you can put your floors wherever you want them. - Reoorganized the elevator/lifts section of the workshop menu. - The robobrain teleporter console can now be painted! - Added almost all remaining Mechanist doors. 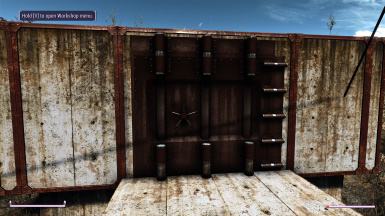 - Remade all the concrete framed doors (Security Door, Mechanist Doors, etc.) with custom collision made by me. - Added the ramp that lowers before you face the Mechanist. - Overhauled the security fences and doors. 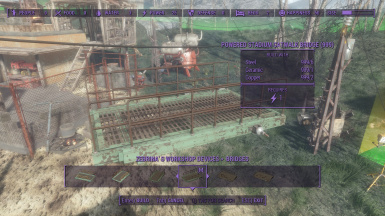 The security doors (and the mechanist ramp) can now be controlled via terminal isntead of power. - Added a Robobrain operated Control Console (For the teleporter) that requires no settler but instead 50 power. - The teleporter parts can now be destroyed and the main part is explosive (it has pretty high health though!). - Added cables that function like the floor conduits included in the Contraptions Workshop DLC. 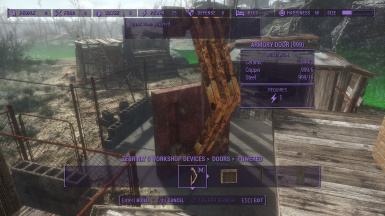 - Any basic door can now be toggled to auto-close using the engineering wrench. - Possibly something else? Note to self: I should add things to this list as I add them. - Made the Paint Mixer give two paints instead of one. 1 + 1 = 1? WTF? - Reworked the Power Lifts. You will need to store existing Power Lift in the workshop and place them again. Sorry for the inconvenience! 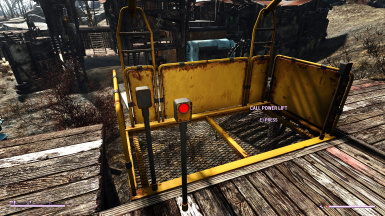 - Power Lifts now only have one button on the lift itself. If a lift only has two floors the button will make the lift go between them. If it has more than two floors then a dialogue will appear where the destination floor can be selected. - Power Lift panels can be detached/attached via configuration. - The Power Lift stairs are now a separate object and there are three variants to choose from. - The Powered Crane Bridges can now have their power state reversed. So that they will lower when powered. Can be changed via Pip-Bo config. - Added a functioning teleporter system similar to the one used in a quest during the main story. By default requires that you complete said quest. - Made Pip-Boy configuration require a special engineering weapon equipped and out. Can be disabled. - Added some help pages accessible through the holotape provided. - The holotape can now be crafted if one is not already present in your inventory. 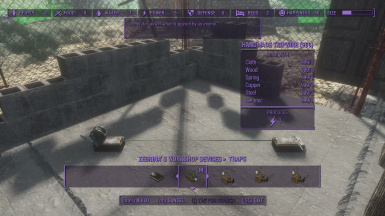 - Added some workshop menu filters. - Made the traps ignored by navmeshing, which should make the npcs not avoid them. - Fixed collision not being immediately updated when placed for certain doors. Previously they would require reloading. - Changed ID Card Reader description. - Added a secondary ID Card Reader that can be used to link multiple ID Card Readers to a single door. - Renamed Night-time Switches to Timed Switches. - Added new Timed (Night-time) Generators. 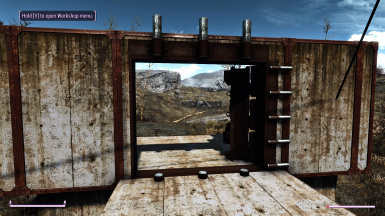 - Added 4 types of Mechanist's Lair doors. In concrete similar to how the security door is added. - Modular climbable ladders (sort of). - Added the new paint cans I've made as decorations. - Added some unconventional doors. - Probably some more stuff I've forgotten about. - Added powered mega security doors. Unlike the door version these are navmeshed. - Added some recolors of the default switches. - Fixed workshop rearranged patch material swaps. - Added a small delay so the circuit breaker can lose power for a brief moment without being reset. - Added the same terminal functionality the default switches have to my button switches. 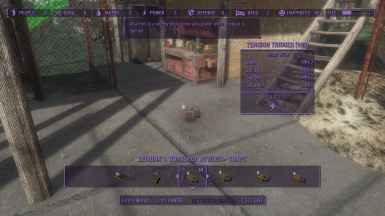 - Added tension trigger traps. - Added a handmade trip wire. Generates 1 power when triggered. - Added a handmade pressure plate (bathroom scale). Generates 1 power while pressed. - Added breakable wooden planks. - Added an ID card reader. - Adjusted many preview transforms. - Reorganized workshop menu a bit. 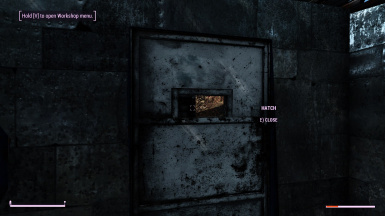 - Mechanists Doors can be closed after gaining control of the Mechanists Lair. This is just a small script so Automatron is not a hard requirement. - The armory door at the castle can now be opened/closed at will after completing the related quest. 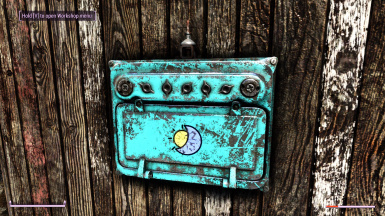 - Fixed the placeable armory door. - The mod now has it's own category. - The Valdacils Item Sorting patch is now applied automatically depending on whether or not def_ui.dll is present in the F4SE plugins. - Added all shack doors from my other mod Shack Door Expansion. 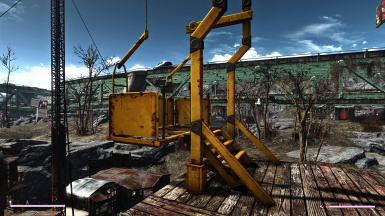 - Added powered crane bridges. - Added a shack themed (power) lift. - Added buttons that act as normal switches + a power button that acts as a normal generator. - Added radiating variants of all switches and generators. 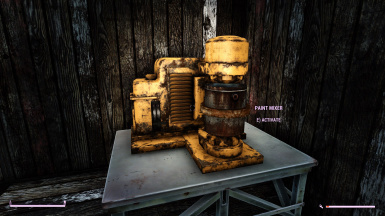 - Remove Science Perk (rank 1) requirement for the Fuse Box Generator and Power Button. - Fixed steel door with hatch (the hatch not being attached to the door). - The multi-part object issue should be fixed. - Added power lift variants with carts that only has side panels. 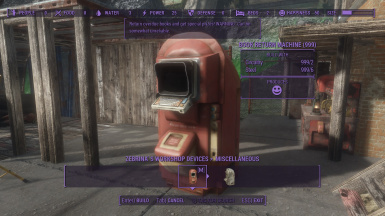 - Made power lift speed configurable through the pipboy (R-Activate). 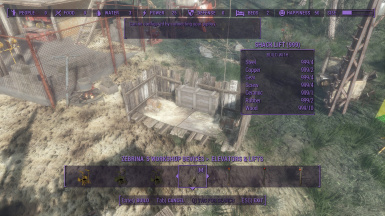 - Merged one of my other mods "Consistent Elevator Speed with Terminal Configuration" into this mod. 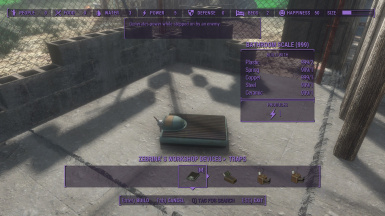 This makes the speed of the Contraptions DLC elevator consistent and also configurable through a connected terminal. - Made some changes to the Book Return Machine prizes. - Fixed not being able to access the terminal on the Book Return Machine. You will need to replace (store or scrap) any already placed Book Return Machines. - Fixed Security Door collision issues. You might have to replace any already placed Security Doors. - Fixed Castle Armory Door. 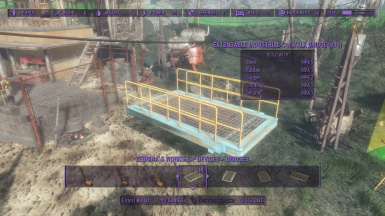 Adds many unconventional and scripted objects and devices to the settlement workshop. Requires all six official DLCs. Buttons - Transfer power for a short adjustable duration. Circuit Breakers - Similar to the standard switch, with some differences. Timed Switches - A switch that is only active during the night. Can be configured via a connected terminal. Crane Bridges - A make-shift bridge that can be raised and lowered. Power Lift - With variable amount of levels. Just place as many buttons below it as you wish, and the lift can go to each one of them. It'll make more sense in game, I hope. Quarry Lift - Functions similar to the Power Lift. Overdue Book Return Machine - With prizes! Paint Mixer - Like the one in game but can also mix purple and orange paint (which serve no purpose however :P). 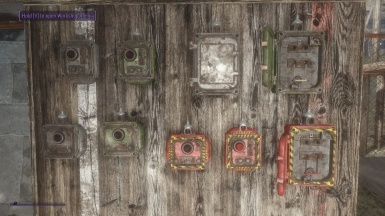 Mechanist Lair Doors - Almost all of them with concrete frame. Door With Hatch - The hatch can be opened/closed independently of the door. The Castle Armory Door - Opens when powered. And more (this list needs an update)! 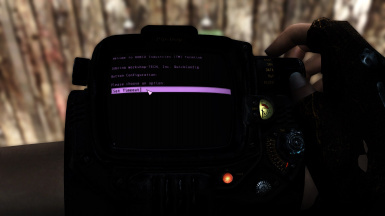 Some objects can be configured by connecting your pip-boy to them (see picture). Snap points are adjusted for Workshop Rearranged by d81, which I can not play without (I have tried). Snap points are also included for Wall Pass-Through Power Conduits by Daedragon.